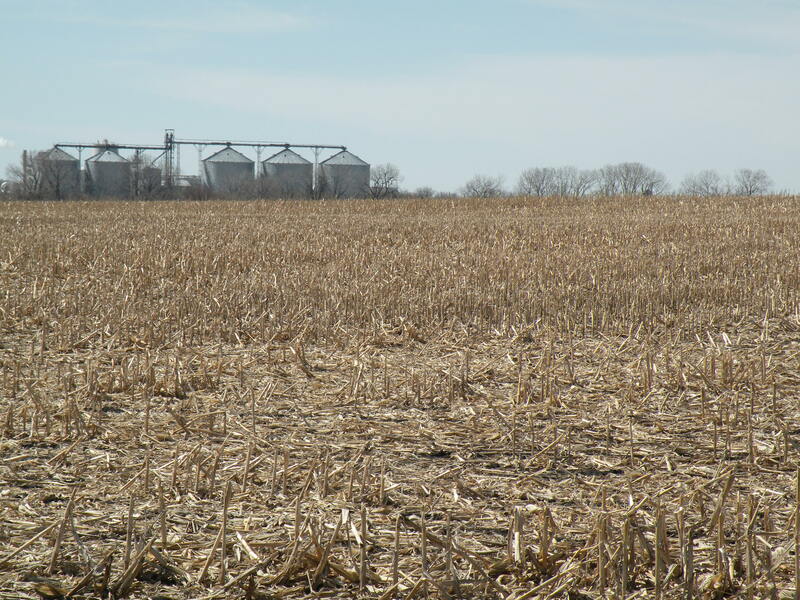 Dr. Mahdi Al-Kaisi, professor of agronomy and Iowa State University Extension and Outreach soil and water specialist, published a great article on the impacts of drought on soil health and management practices that can help reduce drought effects. One of the obvious effects of drought on soil health is the lack of nutrient uptake by crops, as water is the major medium for moving nutrients into plants as a result of water uptake. The increase in soil temperature associated with lack of soil moisture has an impact on microbial activities and nutrient processing, both of which are important for plant use for biomass and grain production. Microbial activities in soil generally are controlled by soil moisture and temperature. The departure from the optimum ranges of soil moisture (water field capacity) and soil temperature (approximately 76-86o F), which varies for different microbial communities in soil, can alter microbial activity. Changes in soil temperature during drought conditions can affect soil organic matter (SOM) decomposition and increase the release of carbon dioxide. Also, during this process additional mineral N, mostly in the form of nitrate, will be released in the soil system. This change in soil environment affects the stability of SOM and subsequently, affects the soil biological system. The most profound effect that can be experienced in cropland is the excess release of nitrate which may not be utilized by crops due to the lack of moisture available for the plant to uptake nutrients. This shift in biological and chemical processes during the growing season influences many other relationships that are essential for crop performance, quantitatively and qualitatively, by changing activities that are important to nutrient cycling such as, enzymatic activities, change in soil chemicals concentrations, etc. 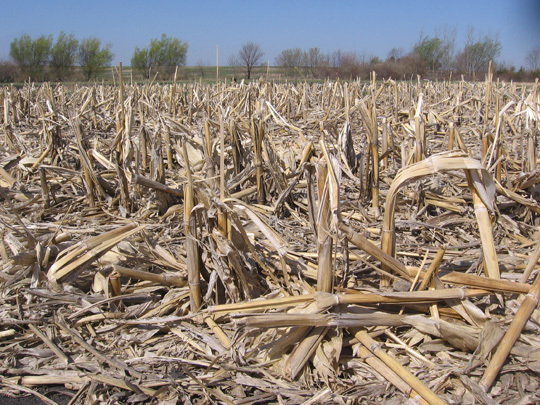 Crop residue: crop residue can provide important benefits like improving soil moisture with an increase in soil water infiltration during and off-season as well as increase recharge of the sub-soil profile. The other benefit of residue is the moderation of soil temperature, where crop residue acts as an insulation layer by increasing soil surface reflectance to sun radiation (i.e., change in Albedo, the ratio of the light reflected by surface to that received by it, where residue color is lighter than soil surface). These benefits of crop residue have direct impacts on soil biological and chemical properties by reducing soil temperature and the slowdown of organic matter mineralization. The increase in soil organic matter can increase soil water storage capacity (Fig. 1). The other benefit of moisture conservation and its availability to crops during drought periods is the increase of utilization of nutrients and reduction of nutrient concentration in soil and loss during off-season rain events. Cover crops: cover crops have many benefits that are critical, especially during drought conditions. 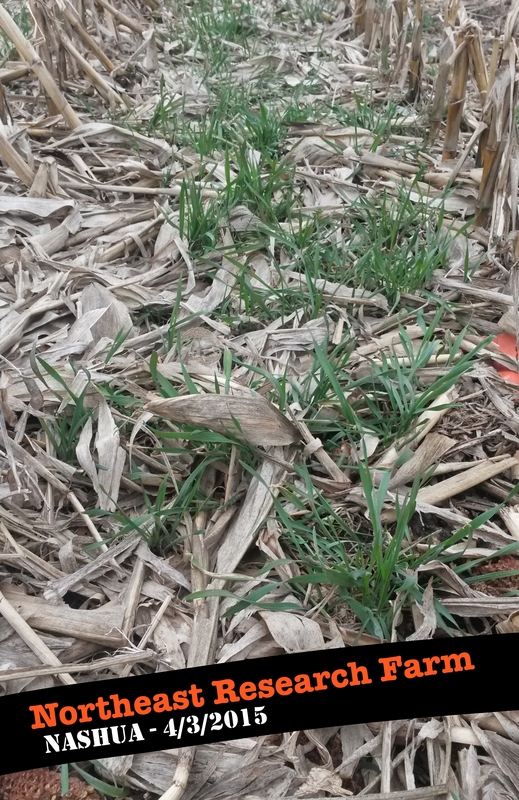 The way that cover crops provide such benefits during drought conditions is based on the cumulative effects of cover crops during previous seasons, where they promote better soil biological and physical conditions. It is well documented that cover crops increased soil water infiltration and recharge of the soil profile by improving soil aggregate stability and soil porosity. Furthermore, cover crops contribute to the increase of the soil organic matter pool, which is essential for building soil health. Balanced crop rotation: crop rotation and diversity of crops within one year or over several years is one of the most important practices that enhance soil health and mitigate drought conditions during the growing season. The diversity of crops on the land can provide a rich soil environment for a healthy and diverse biological system. The inclusion of different crops such corn, soybean, alfalfa, small grain, etc., provides diversity of root systems that promote a wide range of microbial community, therefore enhancing soil nutrient and organic matter pools as compared to a mono-cropping system (i.e., continuous corn). These practices, in addition to organic amendments, are important in mitigating unexpected drought conditions in the long-term. These practices, along with minimum or no-tillage, can reduce the prolonged impact of drought events by increasing soil resiliency. The degree at which soils in Iowa and the Midwest have absorbed the dramatic impact of drought events was due to the rich soil organic matter content. Factors which contributed to that are the temperate climate and vegetation base (i.e., prairie), which encourage greater organic matter accumulation. This unique soil quality provides high water storage capacity that sustains crop production. So, to sustain such soil quality, we need to maintain it through the implementation of soil health principles by adopting conservation systems. The article was published by Integrated Crop Management News on August 23, 2017. Two articles from publications in vastly different agricultural regions—Canada and Mississippi—discuss the same issues that we face here, in between these geographical areas. Both articles contain excellent reasons why conservation practices are worth doing no matter where you live. 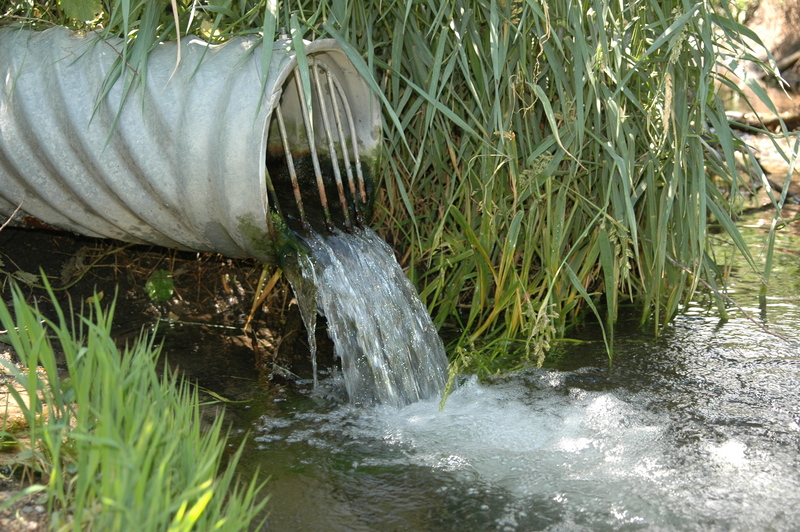 In the article “Where Water Leaves the Farm,” published in Country Guide (“Canada’s oldest farm publication”), retired farmer Don Lobb offers his point of view on agricultural drainage. This story has a lot of data for the Lake Erie area, but the information on the science of soil health is the same for Iowa—everywhere actually. In the article “Improving Water Use Efficiency Starts With Caring for the Soil,” published in Delta Farm Press, the scarcity of water to nourish crops in Mississippi magnifies the issue of water quality. The two articles have great points, written in plain English, on improving soil health through no-till, cover crops, and allowing time for these practices to take effect. Although they focus on land far from us, there are many points that we can apply to Iowa farmland. On yesterday’s No-Till Farmer website, editor Frank Lessiter posted a flow chart showing the benefits of no-till and crop residue. 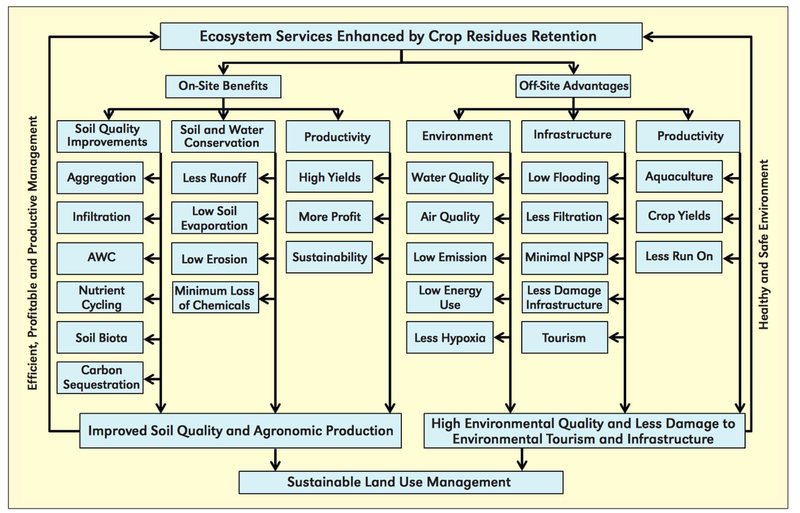 The chart sums up the numerous benefits in few words and little space. 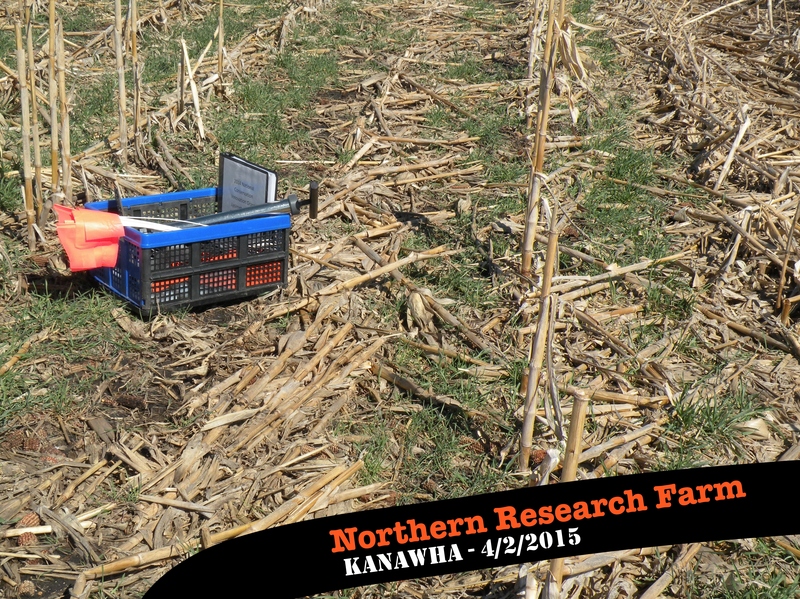 In the last two weeks, Iowa Learning Farms team members have visited five of our cover crop demonstration sites located on ISU Research Farms to check on spring cover crop growth and prepare our suction lysimeters for water monitoring this spring. I posted photos from my trip to the Armstrong Research Farm on March 27, but now that we’ve been to each site, I thought it would be interesting to see a snapshot of how our cover crops (specifically, the over-wintering cereal rye) are doing across the state. 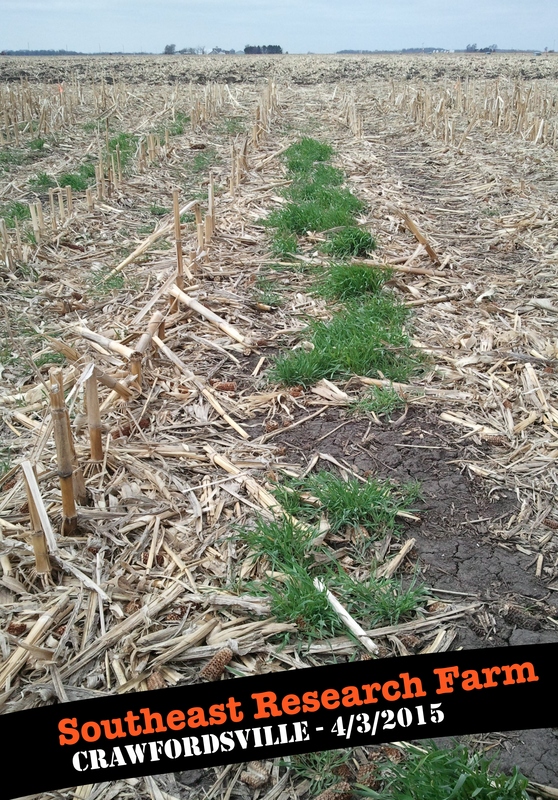 How are your cover crops doing this spring? We’d love to see your spring cover crops photos… share with us on Facebook, Twitter, or send via email to ilf@iastate.edu. 1. When farmers harvest residue for biofuel production, they are promised short-term gains (sales, temporary yield increases), but they also face the prospect of long-term losses (degraded soil quality, reduced agricultural productivity). 2. 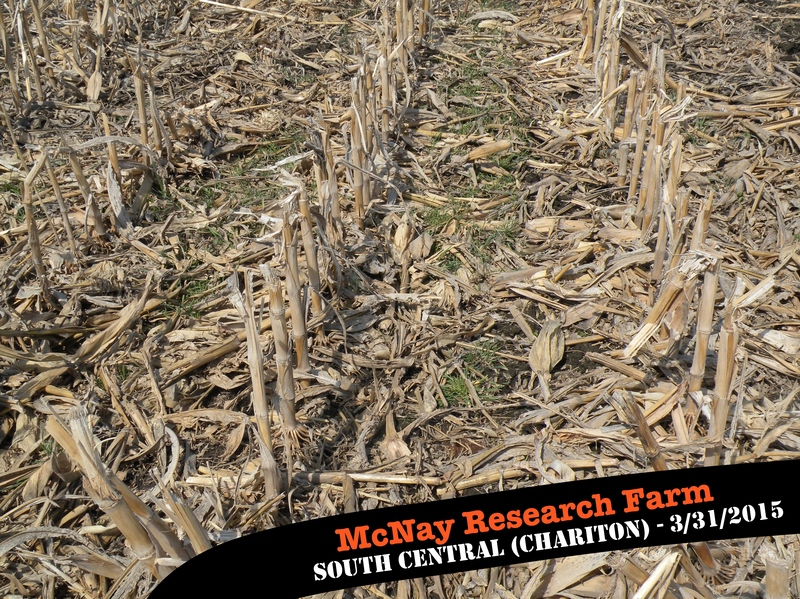 If residue is harvested, biochar can help maintain soil quality by putting lost nutrients back in. 3. 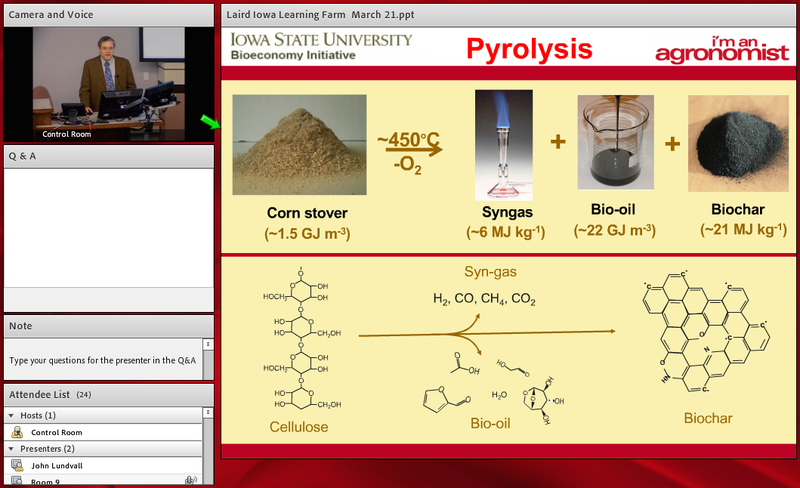 So, the pyrolysis-biochar platform may help make residue harvesting more sustainable. As part of the ILF cover crops research, we have been busy installing lysimeters and we have also been collecting cover crop biomass samples. Given the harsh winter weather and cool spring, the cover crop growth was spotty across the state this spring. 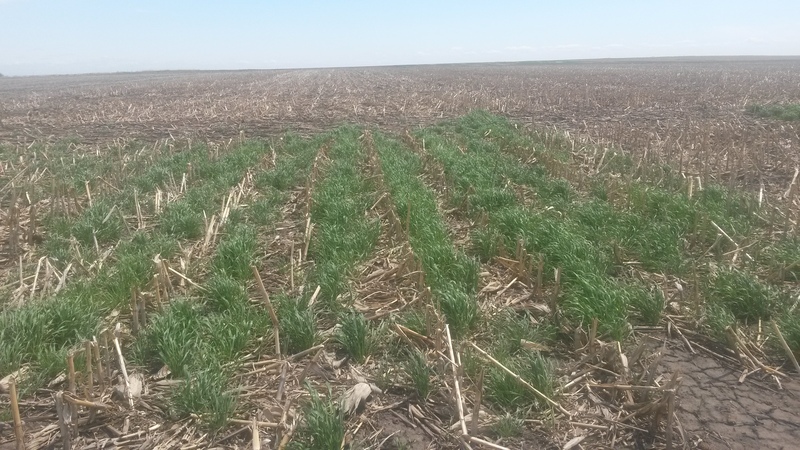 Where the cover crops managed to survive, the cereal rye is the only one to successfully overwinter this year within the mixture plots. 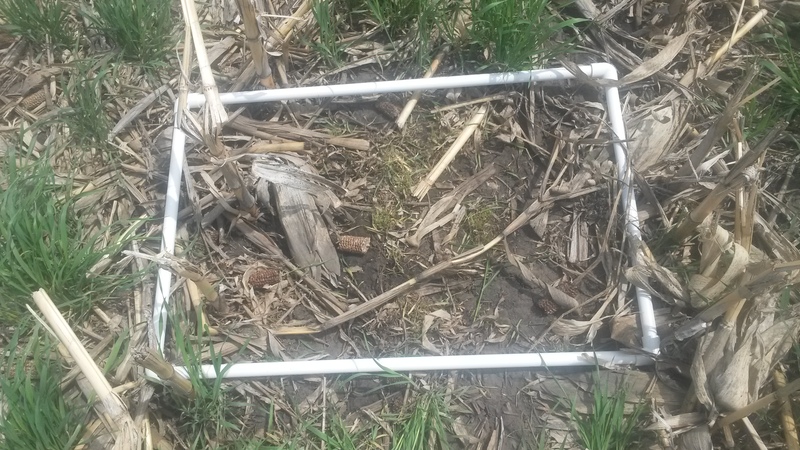 Below are some photos taken during the biomass sampling process Friday, May 9th at the Sutherland Research Farm in Northwest Iowa. 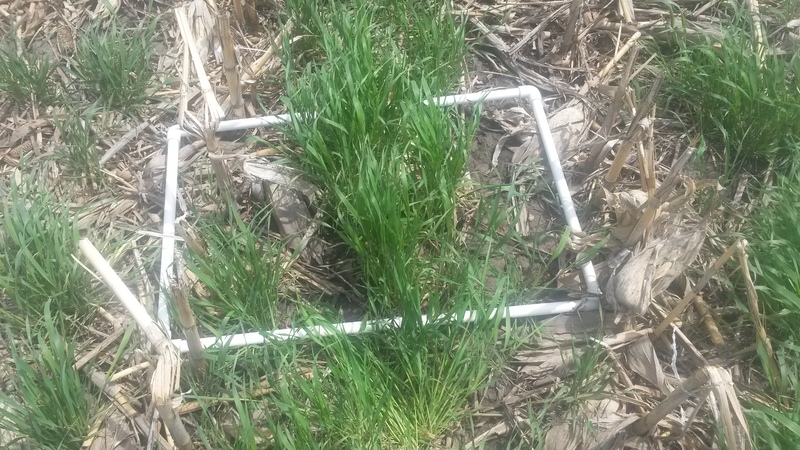 Step 1: Biomass sampling frame is tossed at random within the plot and using scissors, the rye biomass (plant material) is clipped close to the ground and placed in a paper bag. This is done twice per plot. Step 2: The two sample bags per plot are then used to estimate the pounds per acre biomass of the cover crop for the entire plot. Step 3: Back in the lab, the rye is dried and weighed to calculate the pounds per acre. The aboveground biomass is as important as what’s growing underneath the surface. The rye (or other cover crop) covering the soil reduces the impact of energy when a raindrop falls on the land. By hitting the biomass first, the force of the rain is lessened and allows the water to infiltrate the soil gently. 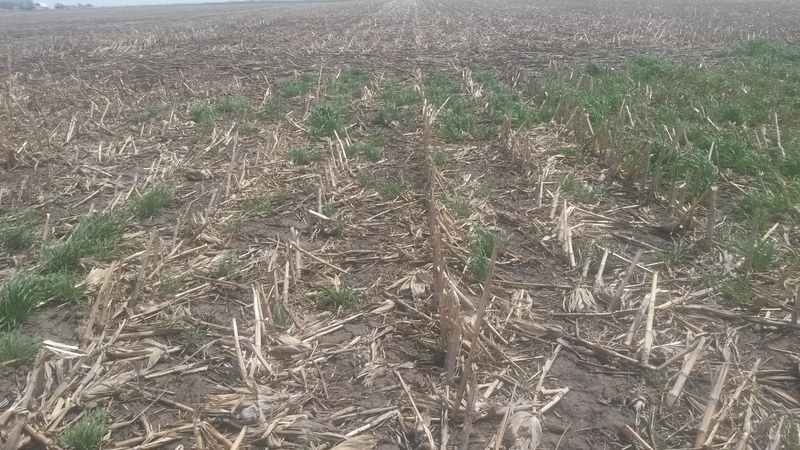 The article “Tips for Making No-Tilled Corn-on-Corn Successful” was published recently on the No-Till Farmer website. 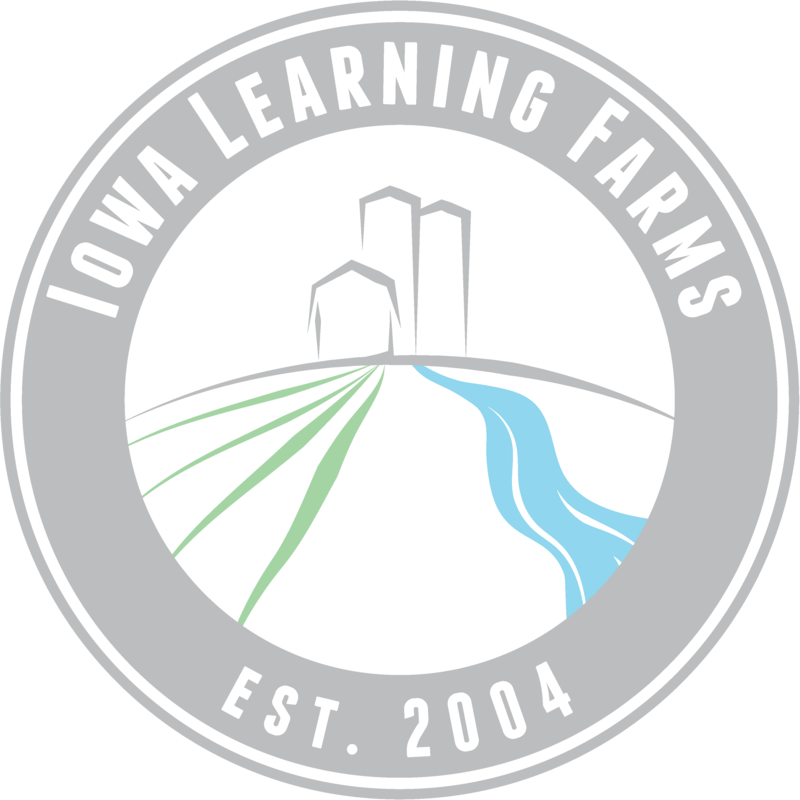 Author Laura Allen includes quotes from farmers from all over the central midwest and also Iowa State University Agricultural Engineer Mark Hanna, faculty advisor for Iowa Learning Farms. The farmers and experts offer advice on all stages of the corn-on-corn growing process from fall harvest through spring planting. Part of the article talks about soil health and residue breakdown. 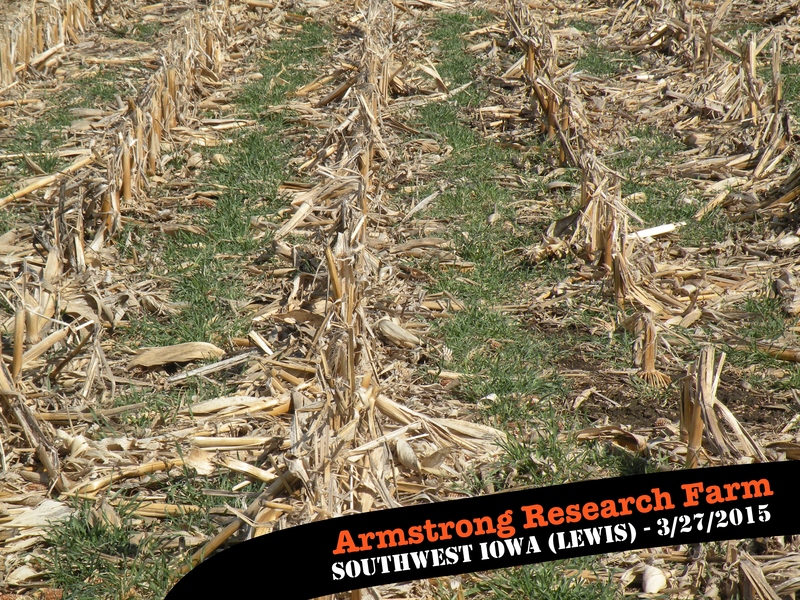 “Myths and Facts About Residue Breakdown” is in today’s Integrated Crop Management News. ISU agronomy professor and former ILF leader Mahdi Al-Kaisi explains the results of his research study on the effects of residue breakdown through tillage and nitrogen application.